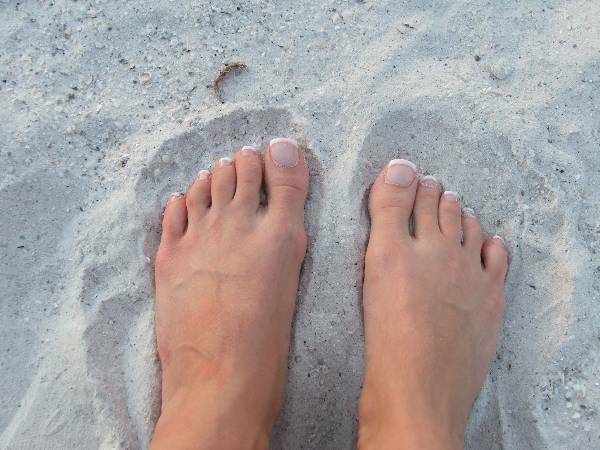 Your feet are your connection to the earth, the grounding force that propels you through life. Contrary to the popular adage suggesting that cool feet make a warm heart, cool feet are often a sign of a poor circulation because of problems with the heart. Paired with hairless toes and a lack of hair on top of the foot, poor circulation because of vascular disease is generally the reason. Consult your physician or ask for a referral to a cardiovascular specialist. A painless, non-invasive vascular study will determine if you have a cardiovascular issue. Thick, hard and yellowing toenails are the symptoms of a fungal nail infection. This type of foot infection grows down below the surface of the nail in the nail bed. Regular OTC fungal treatments do not work on this type of infection. Nail infections signify possible diabetes, especially if accompanied with a strong smell. See your local doctor or a schedule a visit with a podiatrist. If diabetes is ruled out, a prescription-strength, oral antifungal medication, when taken as directed, has your toenails looking healthy again. Gout is a notorious cause of swelling of the big toe and the big toe joint. This swelling, accompanied with pain and red inflammation, occurs when the body builds up too much uric acid. Uric acid, a by-product of the broken down proteins within the body, forms needle-shaped crystals in the big toe joint. Other signs of gout include swollen, red or purple shiny skin, along with heat and pain at the joint site, ankle, Achilles tendon, knees and elbows. Gout is controlled though both diet and medication. See home remedies for gout. A family physician and nutritionist can work with you to alleviate the symptoms of gout. This type of shooting pain signifies a pinched nerve in the lower back. The nerves in the legs and foot originate in the lower back, or lumbar region. Nerves exiting the spinal column often become pinched as they travel down the leg and foot region. The pain is more intense with movement of the body from side-to-side. Pain also flares when stooping or bending to lift. Generally, the pain is contained within the foot region or radiates from the calves into the ankles and feet. Tell your family physician. Your physician will take x-rays and may refer you to a doctor specializing in spinal problems or a chiropractor. Your feet work harder than any other part of your body. Take care of your feet. Choose correctly fitting shoes. Keep toenails neatly trimmed and keep your feet warm and dry. If you find a problem with yellow nails, Houston toenail fungus clinic, Houston Nail Clinic, can help with fast, effective laser treatments.